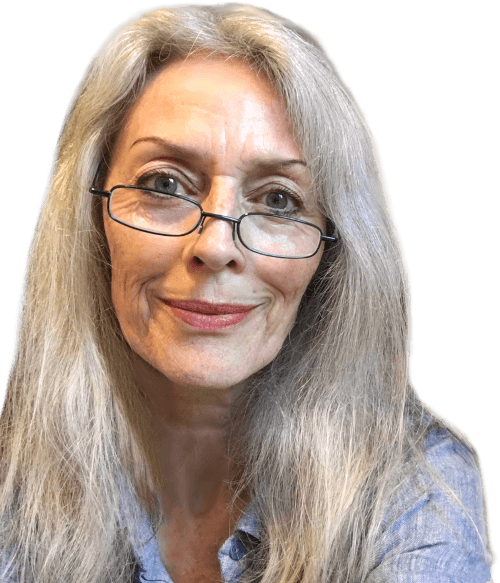 My first experience with with flower remedies was back in the mid-1980s, and was initially to help me resolve a difficult relationship issue (a common starting point!). The result was so swift that I was compelled to delve deeper into this intriguing modality. So of course, I began experimenting on myself, especially using flower essences to enhance my intuition and ‘mandalic focus’ for my astrology work. And I soon found some willing friends who were eager to try this ‘new thing’ for themselves. This was the beginning of my research. I’ve been working clinically now with flower essences for more than 30 years, and have collected a number of professional ranges sourced from reputable producers from around the world, especially to help my clients to overcome self-sabotage and develop the careers they really want. Back in the 1980s, flower essences were just beginning to surface again, with a small number of people, in various countries, venturing to create new flower remedies based on Dr Edward Bach‘s methods from the early 20th century. Much of this movement had been inspired by FES Flowers in 1980, founded by Patricia Kaminski and Richard Katz. FES began to produce new varieties of flower essences, apart from Dr Bach’s 38 Remedies, on their large organic and biodynamic property in California, and have continued to this day. In the mid-’80s, flower essences were largely unknown among the general populace. But I started to build a collection of FES Flower essences; and soon bought the entire kit of the Australian Bush Flower Essences. At a Flower Essence conference in Sydney, in 1992, I met a fellow speaker, the now late Mary Garbely, and was immediately drawn to her New Zealand New Perception Flower Essences, and bought that kit as well. Also at that conference were Drs Rupa and Atul Shah of the Aum Himalaya Sanjeevini Flower Essences of India. On the spot, I bought all the stock kit they had with them, which was most of their range at that time. About a year later, one of my astrology students introduced me to the fabulous Desert Alchemy Flower Essences of Arizona, made by Cynthia Athina Kemp (now Kemp Scherer). I began collecting those as needed (and finally surrendered to buying the entire kit in 2012). By 1999, I was at last connected to the internet, and there I had found Penny Medeiros’ wonderful Aloha Flower Essences (later Aloha MystEssences) of Hawaii. (Sadly, no longer in production). So, after all that, I had quite a collection! You’ll find more about the formulas I’ve designed, with these particular ranges, on other pages of this site (under Formulas in the menu). If you are new to flower essences, maybe start with the menu selections under What Are They? I’ll be offering an introductory online flower essence course very soon, highlighting the designing of personal formulas. And a book on my research with flower essence formulas will be published in 2019, depending on the companion volumes in the series (see my Healing the Source page on this site). Also back in the beginning, in 1986, I had just begun to develop my research involving the creation of a unique system of fresh interpretation for Western Astrology, which eventually dovetailed with my studies of Buddhist Yogacara psychology. This work attracted clients who needed support and direction in their unique efforts to create careers of positive influence, as they were being held back, or confused, by their own subtle self-sabotage. It was evident that these higher aspirations come with their own set of challenges. I discovered that astrology could allow me to define the underlying causes of the subconscious belief patterns that prevent our forward movement in life; and I soon found that astrology and flower essences were dovetailing superbly—with astrology as the ‘diagnosis’, and flower essences as the corresponding remedy for negating the limiting conditioned beliefs echoed in the birth chart. It is vital to heal the ultimate source of your ailments (whether physical, mental, emotional, or even spiritual) to avoid a later repetition of the same or similar conditions. This source always originates from the ‘subtle mind’ (which can be read astrologically). Flower Essence Remedies are also a marvellous adjunct to other modalities that work directly at the physical level when needed, precisely because flower essences can target the underlying emotional and mental aspects of mind. And to support this process, a great many of my formulas have been designed especially for those individuals who are intent on living an exceptional life involving Wisdom and Compassion, to create a beneficial difference to the lives of others, and perhaps to leave a useful legacy from a life well-lived. 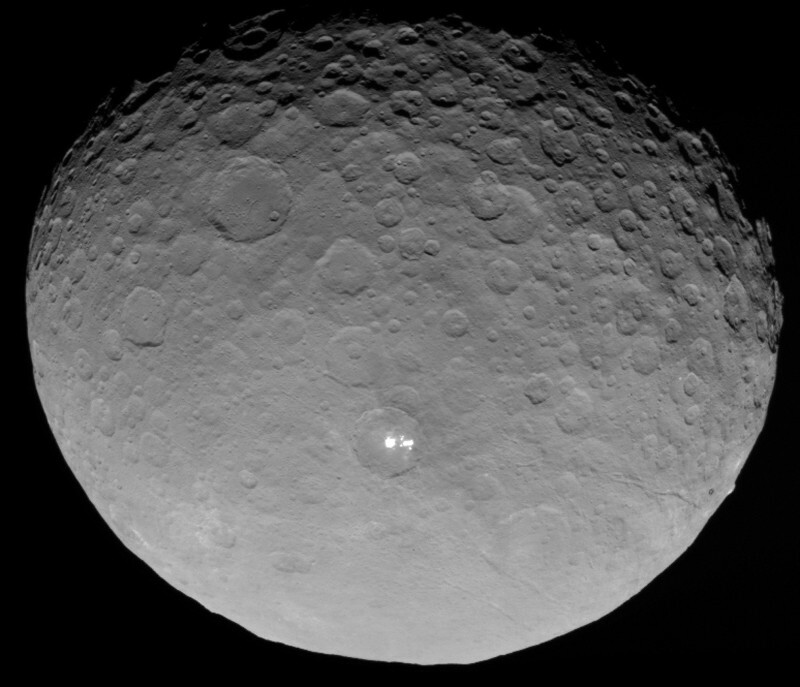 For scale, Ceres has a 1,000km diameter. The mysterious lights in Occator crater (shown here) are presumed to be a type of salt. (There are several bright spots on Ceres.) Astrologically, Ceres’ higher resonance is with the plant kingdom and ecology. My work with flower essence remedies seems to have been a goal I’d chosen for myself, even before my birth. THE EVIDENCE: The asteroids BACH (which can relate to not only Johann Sebastian, but also Dr. Edward Bach, the founder of modern Western flower essence therapy) and AMRITDAS (Sanskrit for ‘servant of the amrita’) are together in my astrological birthchart; and both are directly opposite my Ascendant on which we find the asteroid CERES, the Roman goddess ruling the plant kingdom. Plus the asteroid DATURA (one of my favourite flower essences) is on my Midheaven: a major goal for this life! THE MEANING: These four asteroid themes are to be combined for the benefit of others, and I am but a servant to the ‘life-giving’ higher frequencies of the plants (after integrating the spiritual frequencies of the Sacred Datura flower!). Of course, with the asteroid FLORA next to my Moon’s position as well, it has been the flowering part of the plant that has fascinated me. AND MORE: . . . When you come to understand astrological influences (the Ceres on my Ascendant, in this case), it’s not really astronishing that my father used to call me ‘Petals‘ when I was a very little girl!